What is SophiaCompress(BREW) EARTH ? 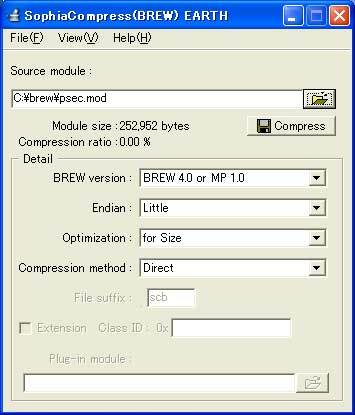 SophiaCompress(BREW) EARTH is the world's first compression tool for BREW applications that minimizes the size of thier mod files. In SophiaCompress(BREW) EARTH, three kinds of compression methods called as "Direct Compression", "Separate Compression", and "Fork Compression" are available. Direct Compression supports the BrewMP 1.0 / BREW 4.0 - 1.0 applet and the BrewMP 1.0 / BREW 4.0 - 1.0 extension. Separate Compression supports the BrewMP 1.0 / BREW 4.0 - 1.0 applet and the BrewMP 1.0 / BREW 4.0 - 3.1 extension. Fork Compression supports the BrewMP 1.0 / BREW 4.0 - 1.0 applet. This method generates the new Compressed Module(.mod file from the Original Module(mod file). This Compressed Module is ready to be executed on the BREW device. The compression ratio is 60-75 %. At the runtime, first, the boot up module inside the Compressed Module is loaded on the device. Then it boots up the compressed module inside the Compressed Module, which then starts the application. In case of the Direct Compression method, since the Compressed Module needs to be resident on heap at the run time, memory consumption is greater than other methods by this size. In general, it is recommended to use the Separate Compression or Fork Compression method except for the BREW 1.0 - 2.1 extension. This method generates the Boot up module(.mod file) and the Compressed mod(.scb file) from the Original Module(mod file). Both files must be installed on the BREW device. The compression ratio is also 60-75 %. At the runtime, first, the Boot up module is loaded on the device. Then it boots up the Compressed mod, which then starts the application. *1. Limitation: The length of the Compressed mod file name must be less than 127 characters. *2. For BREW 1.x / 2.x extensions, only the Direct Compression is supported. *3. The file priviledge needs to be set to the mif file. When compressing Brew MP 1.0 / BREW 4.0 - 3.1 extension using the Separate Compression method, it is necessary to specify the extension's Class ID. 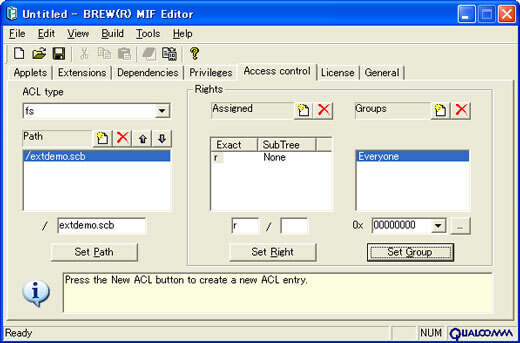 And it is also necessary to set the extension name.scb's ACL in the mif file's setting. The above settings will enable an arbitrary BREW applet or extension to be able to access to the BREW extension compressed by the Separate Compression method. *1. It is necessary to specify the Class ID (8-hexadecimal numbers) in the GUI or CUI only when compressing Brew MP 1.0 | BREW 4.0 / 3.1 extensions using Separate Compression. *2. For BREW 1.x / 2.x extensions, the Separate Compression cannot be used. Only the Direct Compression is supported. This method generates the Boot up module(.mod file) and the Compressed mod(.scb file) from the Original Module(mod file) and the specified Plug-in module. Both files must be installed on the BREW device. Different from the Separate Compression method, the Plug-in module will be embedded into the Boot up module. In general, in the Plug-in module, the code to draw the screen before or after booting up the application or when an error occurs will be described. The Fork Compression method will be effective when an image or a text needs to be displayed since it takes several seconds to boot up the compressed BREW application. At the runtime, first, the Boot up module including the content of the Plug-in module is loaded on the device. Then it boots up the the Compressed mod, which then starts the application. *2. The Fork Compression method does not support any BREW extension. *4. The Plug-in module does not need to be installed into the device, since it is embedded into the Boot up module. A license file called licence.dat, is issued through email by Sophia Cradle Incorporated. A Host ID is required to inquire for a license file. Please use HostID.exe, in the same folder as SophiaCompress(BREW) EARTH, to obtain a Host ID. Execute HostID from the SophiaCompress(BREW) EARTH folder. * The above folder should be located at the following path by default. Press the [Copy] button to copy the Host ID to the clip board. Fill in the blanks below, and send it to . Please send me license file for SophiaCompress(BREW) EARTH. FAQ: What is a license file? / FAQ: What is a host ID? 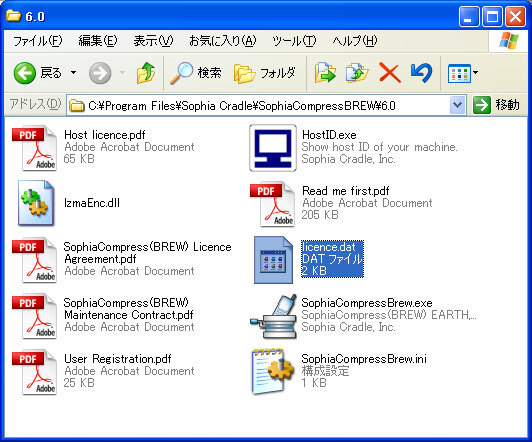 Put the license file(licence.dat) published by Sophia Cradle Inc., in the same folder as SophiaCompressBrew.exe. 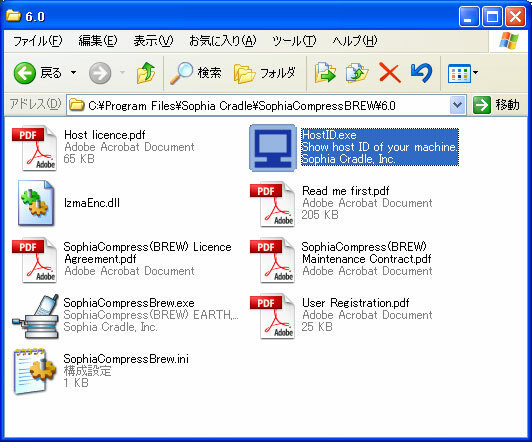 Once the license file(licence.dat) is saved, double-clicking on SophiaCompressBrew.exe will boot up SophiaCompress(BREW) EARTH. Specify the name of the original module file in [Compressed File Name]. Select [Optimization]. If the speed optimization is selected, the boot-up speed will improve about 20% though the size of the compressed application will be a few percentage points of greater than the size optimization is selected. Specify [File suffix] for the suffix of the file compressed using the Separate or Fork Compression method. By default, it is "scb". When compressing Brew MP 1.0 | BREW 4.0 / 3.1 extensions using Separate Compression, check the [Extension] check box, and enter the Class ID (8-hexadecimal numbers). If the Fork Compression method is selected, specify the name of the plug-in module file in [Plug-in module], where processing such as displaying an image or a text on the screen while booting up the compressed application will be described. Click the button labelled [Compress]. Specify the path to save the compressed file in the [Save As] window. The processing dialog will be displayed during the compression. If compression completes successfully, the module size after compression is displayed in green right next to [Module size]. If the size of the compressed module is greater than that of the original module, the size will be displayed in red right next to [Compression ratio]. The original mod file can also be dragged & dropped into the SophiaCompress(BREW) EARTH icon or to the compression window. Select [View] -> [History] from the menu, then the History window will appear. The History window shows the following information from the left side. (*)If the module size after compression is smaller than before, the size and ratio will be displayed in green. Otherwise, in red. To clear the history data, select [File] -> [Clear History] from the menu. -(direct | file | fork) selects the compression method. -file means Separate Compression. More than one of these options cannot be used simultaneously. [-(little | big)] specifies the endian of the CPU. Both options cannot be used simultaneously. When the option is omitted, it is interpreted as little endian. -(brew10 | brew11 | brew2x | brew3x | brew4x | brewmp1x) specifies the version of Brew being used. In the current version, both of the -brew4x and -brewmp1x options will generate the same compressed mod file. [-(size | speed)] selects optimization for module size or startup speed. Both options cannot be used simultaneously. When the option is omitted, it is interpreted as optimization for size. [-plugin] sets the name of the plug-in module file. This option cannot be omitted when you choose the Fork Compression method. [-ov] allows the output compressed file to overwrite the original file with the same name. [-o...] sets the name of the compressed file. The order of the above options can be changed. source.mod specifies the name of the file to be compressed, and must be set at the end of all command line arguments. *1 destination.mod is the name of the compressed module file. *2 If an error occurs, the corresponding error message will be displayed. But no warning message will be displayed even if the compressed module size is bigger than before. Here, increase of heap usage at run time is described for each compression method. Compressed mod generated by SophiaCompress(BREW) EARTH is extended onto heap of the mobile phone as the same module before compression(Original Module ) at run time. Other than Original Module, Boot up Code is loaded onto heap too. Therefore, heap usage increases compared with when SophiaCompress(BREW) EARTH is not used. * It should be noted that Compressed mod will be resident on heap other than Boot up Code and Original Module in the Direct Compression method. In general, except for the BREW 2.1 - 1.0 extension, it is recommended to use the Separate Compression or Fork Compression method where increase of heap usage is only Boot up Code. At run time, Boot up Code, Original Module and Compressed mod are allocated on heap. Different from other methods, Compressed mod is allocated on heap. * The logical size of the Boot up code is about 3 KB. e.g. When the BREW application of 300 KB is compressed into 100KB, increase of heap usage will be 103 KB. Strictly speaking, it will be rounded up to the nearest multiple of cluster size. If cluster size is 4 KB, it will be 104 KB exactly. At run time, Boot up Code and Original Module are allocated on heap. * The logical size of the Boot up code is about 3 KB, but the physical size will be 4, 6, or 8 kb depending on cluster size. It should be noted that Plug-in module will be embedded into Boot up Code. (*) The logical size of the Boot up code is about 5 KB + [the size of the plug-in module]. However, the physical size will be rounded up to the nearest multiple of cluster size. The Fork Compression method requires the plug-in module to be executed before or after booting up the compressed application or when an error occurs, where processing such as drawing an image or a text will be described. The sample plug-in project is stored into the plugin folder. //   and is reserved for future enhancement. //   can NOT be used are reserved for future enhancement. The DrawTypeEnum enumeration type: timing when the "Draw" function will be called. The ForkApplet structure: AEEApplet structure for the boot up module. The Draw function: entry point of the plug-in module. This function takes two arguments, a pointer to the ForkApplet structure, and a value of the DrawTypeEnum enumeration type and draws something on the screen. The drawing content will depend on the passed value. *NOTE 1 The variables for internal use such as id, reference, module, or status must not be updated, since it might cause unexpected behavior. *NOTE 2 Any global variable must not be used in the plug-in module. *NOTE 3 It is possible to allocate memory area from heap for your own data structure and use it via the userdata variable to be set to the pointer to this memory area. In this case, this memory area must be released by yourself. The sample code draws the "Loading..." string at the center of the screen just before extraction. Drawing have to be performed by using the display variable of the ForkApplet structure. When drawing is finished successfully, you should assign the SUCCESS value to the error variable of the ForkApplet structure. In the Draw function, any BREW helper function macro must not be used. However, you can call the BREW helper function via the helper variable of the ForkApplet structure instead. In this case, the BREW helper function name is usually in lower-case. For instance, in the above sample code, the dbgprintf function is used via the helper variable of the ForkApplet structure instead of the DBGPRINT macro in order to output a debug string. To build the plug-in project, install the nmake tool of Microsoft Visual Studio and set the necessary environment variables such as the BREW SDK path or the compiler's bin / include / library folder properly. The environment variables in the sample makefile, which varies depending on the kind of compiler, are as follows. *NOTE* Each of RVCT for BREW 3.0, GNUARM 4.1.1, and YAGARTO 4.4.2 requires BREW Elf2Mod 1.0.2 available at the QUALCOMM's web site. To download this tool, you have to be certified as Brew Developer. To build the plug-in module, you have only to execute the following command. The name of the plugin_xxxxx.mak file as the sample makefile varies among the following strings depending on the kind of compiler. The sample makefile will generate the plugin.mod file, which will be specified as the plug-in module in case of the Fork Compression method. A module built with AEEModGen.c, the standard boot up module of Brew MP 1.0 | BREW SDK 4.0 / 3.1 / 2.1 / 2.0 / 1.1 / 1.0, can be compressed and executed without problem by SophiaCompress(BREW) EARTH. SophiaCompress(BREW) EARTH does not support BREW applications developed with boot up modules other than AEEModGen.c, and we do not guarantee performance with non-standard modules.